Bright purple in the glass. Lifted aromas of blackberry along with hints of ripe plums and spice. This is a medium bodied wine showing an abundance of sweet fruit and ripe silky tannins. The oak is well judged and contributes to the persistent finish. Growing conditions: Vintage 2014 was off to a great start. Settled warm weather patterns throughout spring provided optimal flowering conditions and resulted in an even and abundant fruit set across all varieties. December and January recorded slightly cooler than usual temperatures with about average rainfall allowing strong canopy growth. Cyclone Lusi was a feature of March bringing a brief period of high winds, but fortunately very little rain. Both February and March were warm and dry allowing good ripening and flavour development. 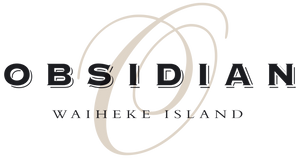 Harvest at Obsidian concluded on the 12th of April. Hand picked on the 7th April 2014. The majority of the fruit was destemed to open-top fermenters, while around 10% was added directly to the fermenters as whole bunches. Twice daily plunging during fermentation before an extended maceration period post fermentation. The wine was aged in 40% new French barrels for 14 months before a light fining and bottling.